In other news, get a load of Angelique’s aunt. She’s one of those Spanish-Jewish gypsy types that you see so often at family reunions with their blue-eyed, blonde nieces. I know, it’s the twenty-first century and I’m not supposed to see skin color or hear New York accents, but I still do. This is an unlikely aunt. 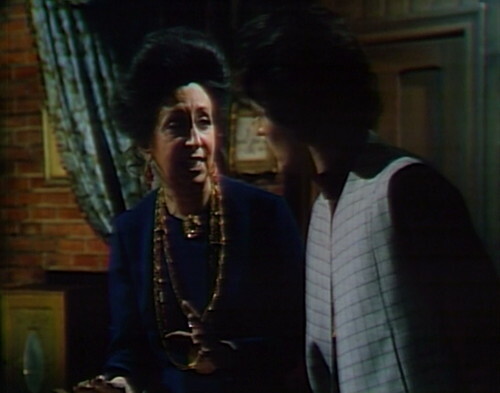 Although, honestly, the most unlikely thing about the entire scenario is that Aunt Hannah confirms that there really is such a person as Angelique’s twin sister Alexis, which pretty much knocks all the stuffing out of the “is she Angelique or Alexis” mystery, as far as I’m concerned. Angelique Collins is dead, you see. Six months ago, she died of a stroke at a seance, just to spice up a dull dinner party. 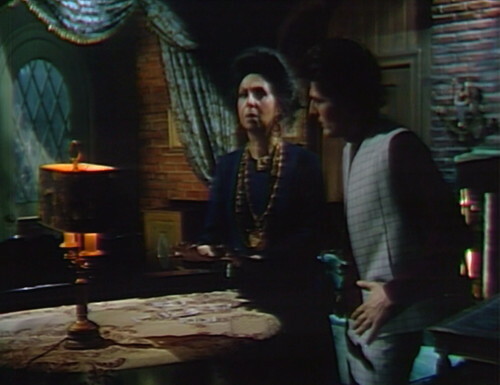 But now she’s come back to Collinwood, apparently, in the guise of a twin sister that nobody’s ever heard of, so everyone who loved and hated and feared Angelique is on tenterhooks, desperate to discover whether this is really the dearly departed. Now, obviously, the solution to this mystery involves the shocking fact that Angelique was an only child! !, which gives you a nice strong reveal, followed by a dramatic close-up of the woman in question, at which point we can all move on with our lives. That’s how they’ve been playing it so far, at least; everyone’s been acting like the concept of identical twins is entirely new to them. So when Aunt Hannah says, “Alexis and Angelique are my nieces, don’t you suppose I can tell them apart?” then the obvious answer is yes, of course you can, and never mind, I guess it doesn’t really matter. Although, you know what? A couple weeks ago, Carolyn said that Angelique wanted to marry Quentin since she was a little girl, growing up in Collinsport. So how is it possible that Quentin and Hoffman and everybody else have never met Alexis before? I can’t believe it’s taken me all this time to think of that. We might have to send this storyline back for rewrites. Because this is where the idea starts to feel kind of thin, like they’ve taken a two-week story and they’re stretching it to four weeks. It’s been long enough that if this really is Angelique, then she’s in pretty deep cover, cause she’s not doing anything Angeliquey. She’s not cursing or poisoning or choking people, or playing any of her other favorite party games. She’s just hanging around the house, acting like a perfectly nice lady who lives here now. So in order to keep the tension up, everybody around her has to act super suspicious, watching her every move with the intensity of a TMZ reporter on their first day of work. 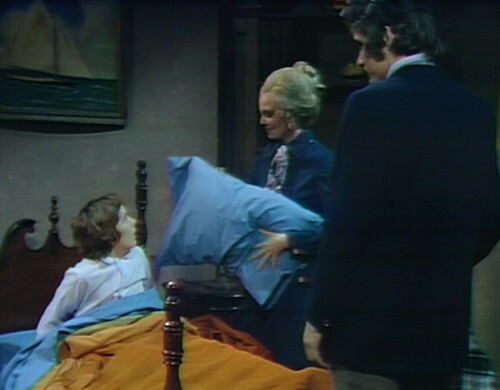 In today’s episode, she tucks her nephew Daniel into bed, and hums a little tune while she fluffs up his pillow. Here’s Quentin’s reaction. You see? Open-mouthed amazement. That’s for humming. And Daniel responds the same way. Because when Angelique was alive, and tucked Daniel in, she would hum exactly that song! So consider that admitted into evidence. And then: the flowers! 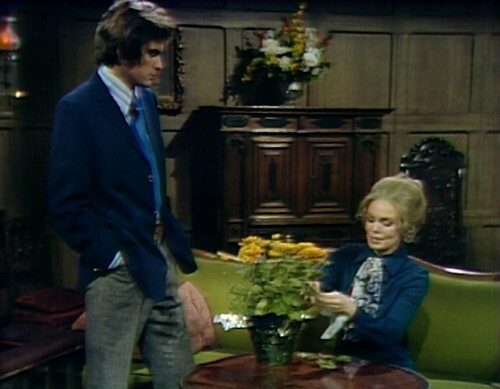 Alexis is sitting in the drawing room, making conversation as she prunes a bunch of chrysanthemums, and Quentin gets that faraway look on his face again. “Oh, yes,” Quentin says, making this face. “As a matter of fact, that’s exactly what she did.” This face. So Quentin leaves, and Alexis just stands there, with a fistful of plant matter, thinking, dear God, do I have to justify every goddamn thing I do to you people? Christ. It’s no wonder I faked my own death and assumed my twin sister’s identity, I couldn’t stand to be a member of this family for another five minutes. And then she just throws the leaves on the rug, and vows to never hum again. So anyway, do you remember that perfectly sensible thing that Aunt Hannah said to Bruno, about how she’d know the difference between Angelique and Alexis? Well, you can cross that idea off the list. Hannah sits down with Alexis, who never liked her and doesn’t intend to start now. Everyone in the family always liked Angelique better than Alexis, including their father and dear Aunt Hannah, and Alexis isn’t particularly interested in developing her personal brand. She flares up almost instantly, and asks Hannah to please excuse her, but she has other things to do with her time. This is exactly what Angelique would do if this was Angelique, and it also happens to be what Alexis would do if this was Alexis, which it is. So Hannah punts, and steals a handkerchief to perform black magic rituals all over it. Back at Bruno’s place, Hannah sprinkles the handkerchief with dried herbs and bone dust, whatever that is, and then the handkerchief bursts into flames, which is apparently inconclusive. The handkerchief ritual’s a bust, go figure, so Hannah lays out some tarot cards, for her third failed divination technique of the day. So, great, that’s just what we need, a tarot lawyer. Apparently every one of these techniques has some kind of fine print. We’ve tried the cards, the stars, the pillow, the plant and the fine washables. Next, we could drag out the crystal ball, if you feel like, or we could wait forty years and see if anybody invents an app for this. I tell you, New York stage gypsies need to watch out. This is an industry just begging to be disrupted. Tomorrow: All I Know Is Danger. In the first act, when Quentin turns away from Daniel and Alexis, the boom mic is visible above the bed. At the beginning of Bruno and Hannah’s second scene, something falls over with a clatter in the studio. There’s quite a bit of studio noise today, in little bits throughout the episode. One amusing example happens when Hannah is setting out her tarot cards. She tells Bruno, “I must have silence — complete silence!” and immediately after that, there’s some studio noise. During the end credits, somebody casts a shadow on the tablecloth. It sticks around for most of the credits, and then slowly moves away. Hannah Stokes is played by Paula Laurence, in seven episodes over the next month. 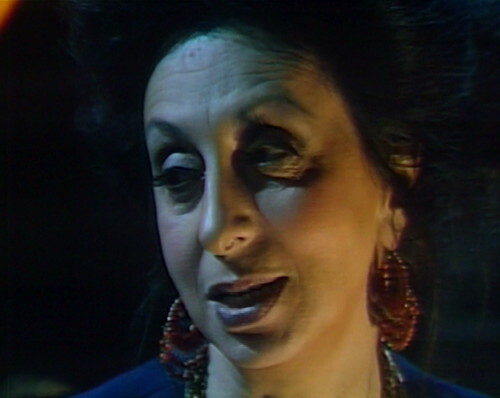 She’s basically a fill-in role for Thayer David, who’s busy filming House of Dark Shadows. Hannah does all the stuff that “Timothy Stokes” would have done, and when he returns in episode 1027, Hannah is forgotten. Paula Laurence had a Broadway career spanning three decades, from 1936 to 1967. She mostly appeared in comedies, including some musicals — Something for the Boys, One Touch of Venus, The Liar and Funny Girl. She also played the Female Beetle in the 1948 production of The Insect Comedy, Karel Capek’s satirical play about life in post-WWI Czechoslovakia. She also appeared in a couple episodes of Law & Order, but who didn’t? 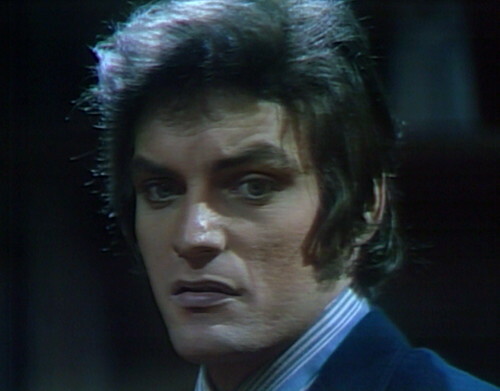 David Henesy is the last cast member to leave for the House of Dark Shadows filming, and he’ll be the first one to return. 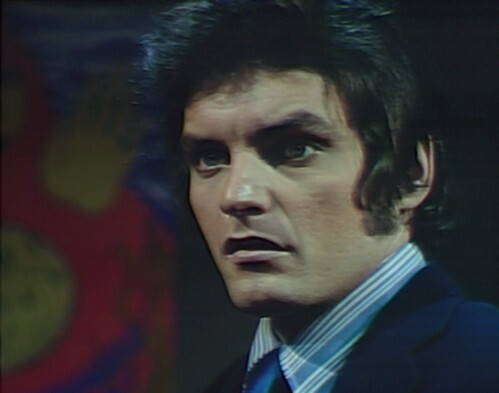 He’s only gone for two weeks in broadcast time, although it was closer to a month in real life — the production shuts down for a week and a half in the middle, burning through the episode backlog while they wait for the House of Dark Shadows cast to come back. Everyone should be lucky enough to have an Aunt Hannah (mine was named Jennie). She’s the older relatives who’s on the outs with the rest of the family because she doesn’t go to church and/or has a live in boyfriend. She dyes her hair blonde, wears bright red lipstick and nail polish, big junky earrings and too much perfume. She lets you drink her beer and read her ‘dirty’ romance novels. And if she studies astrology or palmistry, so much the better! Mine “was” Aunt Diane. Unfortunately, she became a born again Christian, and the wild, fun, quirky aunt became a quiet, hollow stepford wife. She’s still around, but I consider her an imposter. What did she do with the real Diane? She was my mom’s twin sister who never married, spent summers working on a deep tan, wore long hairpieces, dated man who lived on boats, and learned Greek swear words from her best girl friend. I think I would have liked your Aunt Jennie! Speaking of Selby, he made an appearance in episode 1 of that splashy new superhero series “Legion”. Not sure if he will be back or not. On TV in 1969 and 2017, remarkable. 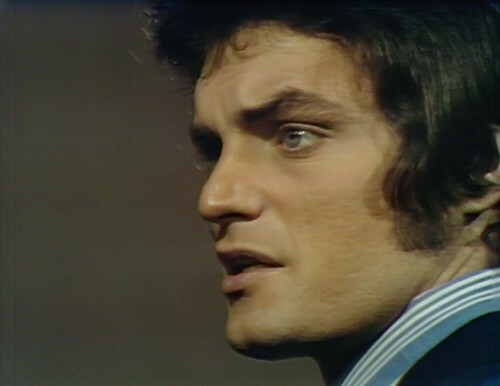 Spoiler alert: David Selby is supposed to be in the first 3 episodes of Legion, according to ShadowGram. So how is it possible that Quentin and Hoffman and everybody else have never met Alexis before? Wasn’t there a similar ‘shock’ when Chris Jennings appeared? Poor Joe had a conniption, then – oh, right, never mind, didn’t Tom have a twin brother or something? It was a thin plot trick then, and even thinner now, since it’s been done before. So Aunt Hannah is right; the dead can return in many ways. Doggone shame that Parallel Time Janet Findley is the head stenographer at Sincere Trust. Bet SHE could have got some answers for Bruno. Alexis was sent to boarding school for her own protection at age five, when it was discovered that the bell-pull at her bedside had been replaced by this by a swamp adder, the deadliest snake in all India. In an interesting related coincidence, it was also discovered that there were no bell-pulls in the house at all. Yeah, I’d believe Timothy Stokes would have a sister like Hannah. Professor T Eliot Stokes? Not so much. I’m fascinated by the back story in the Stokes household. It sounds like the late mother of Angelique & Alexis had something going on. A witch perhaps or someone who dabbled in witchcraft when she wasn’t teaching her daughters about horticulture. And what happened to her husband and father of those twins (who probably looked like the kids from Village of The Damned or Rhoda from the Bad Seed when they were little)? Maybe their dad was the PT Nicholas Blair You’ve got a widow with two young daughters who marries black arts practitioner Tim Stokes..who adopts the girls and gives them his last name. After mum died Hannah probably hung around a lot..when she wasn’t running the gypsy tea room near the wharf. Oh Yes! And also poor little PT Ned Stuart & his Penmanship medal! You know, I doubt Angelique tucked Daniel/David in that often – she was too busy tucking in all her male admirers. She also didn’t have time to be pruning no house plants. While it would have been fun to see Clarice Blackburn (otherwise engaged at the time) take on Aunt Hannah, Paula Laurence is a neat cameo: she was a stalwart Broadway and regional theater fixture for a long career, performed with Orson Welles and John Gielgud, and she and her husband, who were close to Tennessee Williams, took responsibility after his death for Williams’ institutionalized sister, Rose (the model for Laura in Glass Menagerie). She’s pleasingly actressy, which is perfect for the role. The writing team began to play more with character humor from time to time, and this is a nice infusion. I wish they’d kept Paula Lawrence in the repertory fold, as well as the lady who played Janet Findlay. They are very Dark Shadows. With a healthy dose of Hush, Have, Sweet Charlotte thrown in for good measure. What’s that rolling down the stairs?!? I don’t know why, but the picture of Aunt Hannah on the couch looks like she’s poking her head up from behind it, which I find very amusing. Oh my god, it does! That’s hilarious! Okay, this is me, shouting into the void; but I have to get some things off my chest. I don’t ordinarily shout at the television, especially not DS, but . . . Alexis “I am nothing like my sister” Stokes has broken me, so I’m going to yell at her. Of course you’re nothing like your sister–you know your appearance has terrified a small child and precipitated your new sister-in-law’s flight from the house and yet you still agree to stay there???? You have relatives in the area–why aren’t you staying with Aunt Hannah? Nothing says Angelique more than staying in her room, wearing her clothes, playing her music on her piano, and snogging her erstwhile husband. And while I’m at it . . . why are you swanning around the drawing room in your nightwear? Is the house on fire? I can’t think of any other reason to parade around someone else’s house in fancy underwear. 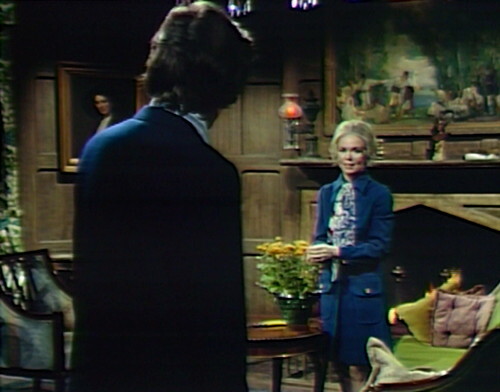 So shoehorning yourself into the Collinwood household made it almost inevitable that Angelique would steal ;your life-force for her second coming. You made it just too easy . . . I haven’t been able to quite figure out if the rest of the Collinses (and others) were aware of the twin Alexis before she appeared or not. It’s been rather ambiguous to me. Perhaps I’ve missed something explicitly said. If there is a real Alexis safely ensconced in Europe (and has been for many moons), then it’s certainly plausible that Angelique could be pretending to be her because the real one is far away, she’s not likely to show up, and no one’s seen her for a long time. And as for “Angeliquey” things, she did seem to supernaturally choke Bruno–he came running into her/Angelique’s room choking to death. Alexis goes into a drawer in a small table and does something, and Bruno stops choking. Alexis claims she was just getting the pruning shears (of course we don’t see what she actually did, though I presume she was untying a cloth from a doll’s neck, since Angelique’s stock-in-trade is getting all voodoo-chokey). And then we have today’s self-playing piano. “Alexis” could certainly be pretending she’s frightened of it to throw suspicion away from her and onto the presence of Angelique as a spirit. And as for the efficacy of Aunt Hannah’s tarot cards, astrology charts, and burning handkerchiefs, such as it always is. Everything supernatural always just beats around the bush, from Natalie’s tarot cards in 1795, any seance spirit that speaks, any ghost that shows up, etc. You know I started watching the episodes of this storyline a week ago out of curiosity and all I can say is that it might be the most tedious period of the show Ive personally witnessed. It drags and drags and the supporting players of Bruno, Cyrus, and Sabrina are honestly so mind numbing. I LOVE seeing Lara Parker even if its just as the comparitively bland “Alexis” but the conflict here is so forced and hard to get invested in.